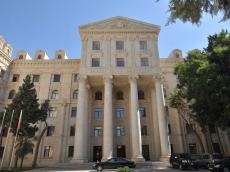 Information about foreign citizens who illegally visited the occupied Azerbaijani territories by grossly violating Azerbaijan's laws is being investigated, the Azerbaijani Foreign Ministry said in a message on Oct. 8. The Azerbaijani Foreign Ministry was commenting on a visit of Armenian prime minister’s spouse Anna Hakobyan together with a group of women from Russia to Azerbaijan’s Nagorno-Karabakh region occupied by Armenia. “As soon as these foreign citizens are identified, the decision on adding their names into the list of foreigners whose entry to the Republic of Azerbaijan is denied will be made,” the message said. “Further to our already stated position on the “Women for peace” initiative of Armenia, we would like to reiterate that those who want peace would not continue the war, those who want to prevent the loss of lives would not keep the territories of other states under military occupation and those who invite women and mothers to peace would not send their sons to the internationally recognized territories of Azerbaijan for military service,” the message said.